EXCLUSIVE Part of our Lotsa Love® plush collection, our personalized Tommy Teddy is a big & cuddly way to congratulate a proud new grad. 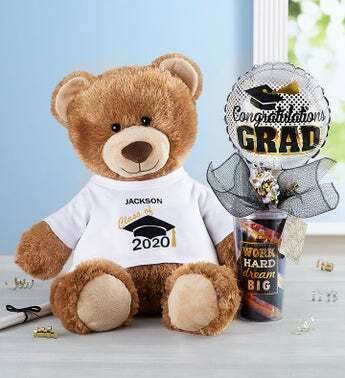 Standing two feet tall, this soft plush bear wears a T-shirt featuring a graduation cap design. Customize it with the grad’s name and graduation year to make their accomplishment even more memorable. Continue the celebration by adding a reusable tumbler full of assorted candy, topped off with a festive balloon!